Question 69: I just want your take on the Watchers and the Book of Enoch in the Orthodox Tradition. I've tried to get an appropriate understanding on this so I have a lot to say; but your reply can be as long or as short as you wish, just asking for something definitive which you know or some reliable source to which you may point. I noticed that the Book of Enoch was taken seriously by the Jewish tradition all the way through the time of Christ. A few of epistles reference it in the New Testament, sometimes the Gospels too (Luke's transfiguration account is the most fascinating one to me). Of course, Jude provides a direct quote. It seemed authoritative to the Apostles. Early Church Fathers even seem to give it high regard and accept its teachings. There was even some debate (it seems) whether or not it was Scripture. It was never included in the LXX, so that was always against it. I speculate (but can find nothing on this) that when the canon of Scripture contracted some from the canon the Montanists were putting forth, the Book of Enoch might have been in the same genre or vein that it was not to be included in the Orthodox canon (with its absence in the LXX always overshadowing it). After that, it seems it disappears until the Byzantine chronicler George Syncellus includes portions of it (maybe the reliable Orthodox portions?) I find next to nothing about this except it seems to be during a time when Byzantine historians were interested in making a grand history of the world. They use the word "egregori" for what we in English call Watchers. I don't know Greek so maybe there is some history to this word or a specific definition which has a specific context attached to it? The Fathers since that time do not seem to have an interest or maybe there is a specific reason they do not talk to them. I have little interest in Protestant academics. They seem totally enslaved by their ideologies and of course are not under the illumination of the Holy Spirit. I rarely find anything of value in them. I am in love with the Fathers. However, someone introduced me to Dr. Michael Heiser. He seems to treat this subject very well and makes very strong arguments. His idea of the divine counsel is just a pale glimpse into what St. Dionysios the Areopagite explains in his "Celestial Hierarchies." This is what got me curious on Enoch. So what do you know on the Church's treatment of this topic? Do you know of writings from respected Orthodox Fathers or writers on this that I am just unable to find? Like how some might treat Revelation, it seems like such a topic can open the door to all sorts of dangerous thinking. Is this how the Church has treated the topic or is there some other circumstances or criteria? Answer: This is actually a big and controversial topic that I usually don't discuss in emails or here at Erotapokriseis at any length, because I do want to go fairly deep into it in regular posts. But I will answer your question by saying that nobody really knows what the Fathers thought about the Book of Enoch. They hardly discussed it. What we do know is that the Jews never considered it part of their canon, so for this reason alone the Christians were going to reject it, at least for the most part. If anything, they may have treated it like we do the Protoevangelium of James, which would never be considered part of Scripture, but is the source of important traditions in the Church. At least Enoch holds some interest to Christians, but I don't believe any later Church Father seriously considered that Enoch wrote a book that was preserved by the Jews, and probably knew that it was a book written after the Old Testament canon. Even the section of Jude that you talked about is really just a midrash on Deuteronomy 33:2, so the Book of Enoch was not needed for the text. Also, the Jews generally rejected the ideas about fallen angels described in Enoch. This is illustrated by the comments of Trypho the Jew when debating with Justin Martyr on this subject: "The utterances of God are holy, but your expositions are mere contrivances, as is plain from what has been explained by you; nay, even blasphemies, for you assert that angels sinned and revolted from God." Some of your other examples in favor of Enoch I would personally reject, but there is too much there to get into any details here. 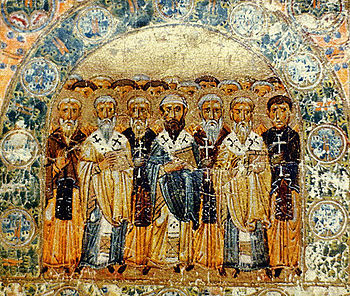 Lastly, the idea that fallen angels were the sons of God mentioned in Genesis 6 that impregnated the daughters of men and gave birth to the giants of old was rejected by the Church Fathers after the fourth century; this is probably the main reason the book was never really taken seriously by serious theologians. Question 70: Are there any Church Fathers or patristic works that you think non-monastic laity should not read? Answer: I think anything could be read by anyone if the proper context is kept in mind and they can find what is beneficial in it. However, often times the proper context is not known by people, and they end up misinterpreting texts. For example, I once helped someone embrace the Orthodox life on a deeper level, and behind my back they bought the book "Ladder of Divine Ascent" by St. John Climacus. He read the book, locked himself in his room for six weeks, and would not speak to anyone, including his mother that he lived with and his fiance that he was engaged to be married to. He would basically just go to work and come home and lock himself in his room. It took me a long time to convince him that those first few chapters that speak about withdrawing from family and friends to get in a closer relationship with God were not meant for someone living in the world, and if he wished to do so he should go to a monastery. It took him a while to figure out what he wanted to do, putting his family and fiance through much pain and distress in the process, but he eventually realized that he was taking things too far, and came back to his senses. For beginners, a lot of this material is very confusing and troublesome, and could wreak much havoc in their lives, which is why they should be subject to proper guidance and obedience with what they read, until they are at least mature enough to know their own personal role in their newfound Christian faith. I have no problem with a beginner reading the "Ladder" and going off and becoming a monk; the same can be done reading the Gospels. It is a problem however if it puts you in a spiritual and mental paralysis, especially if it leads to despair. But on the opposite end, others read patristic literature in other very immature ways, such as to justify their sinful behavior, or to subject the text to intellectual criticism, or just to increase their knowledge, etc. If you are a Christian, you should seek to be personally benefited when reading a patristic text, and this above all takes humility and reverence. When read this way, everything you read will be a source of great benefit.